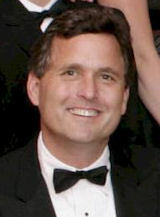 Marvin Bush. [Source: Eric Draper / White House]A security company called Stratesec acquires an $8.3 million contract to help provide security at the World Trade Center. It is one of numerous contractors hired in the upgrade of security at the WTC following the 1993 bombing. Stratesec, which was formerly called Securacom, is responsible for installing the “security-description plan”—the layout of the electronic security system—at the World Trade Center. It has a “completion contract” to provide some of the center’s security “up to the day the buildings fell down,” according to Barry McDaniel, its CEO. Involved with Airport Security - Another of Stratesec’s biggest security contracts, between 1995 and 1998, is with the Metropolitan Washington Airport Authority, providing electronic security for Reagan National Airport and Dulles International Airport. Its work includes maintaining the airfield access systems, the CCTV (closed circuit television) systems, and the electronic badging systems. American Airlines Flight 77—one of the planes hijacked on 9/11—takes off from Dulles. Directors Include Bush Family Member - Marvin P. Bush, the youngest brother of future President George W. Bush, is a director at Stratesec from 1993 to June 2000, when most of its work on these big projects is done. Wirt D. Walker III, a distant relative of George W. Bush, is chairman of the board at Stratesec from 1992, and its CEO from 1999 until January 2002. Another of Stratesec’s directors, from 1991 to 2001, is Mishal Yousef Saud Al Sabah, who is a member of the Kuwaiti royal family. Al Sabah is also chairman of an investment company called the Kuwait-American Corporation (KuwAm), which, between 1993 and 1999, holds a large, often controlling share of Stratesec. In 1996, it owns 90 percent of the company; by 1999 it owns 47 percent. Other Interests - Walker and Al Sabah are also co-investors in two inter-related aviation companies: Aviation General and Commander Aircraft. According to a 2005 report by freelance journalist Margie Burns: “Aviation General boasted of its international clientele. A 1996 press release announced its sale of airplanes to the National Civil Aviation Training Organization (NCATO) of Giza, Egypt, ‘the sole civilian pilot training organization in Egypt.’ The announcement mentions Al Sabah as chairman of KuwAm and board member of Commander Aircraft Company.” NCATO also has contractual partnerships with several US flight schools, including Embry-Riddle University in Florida.